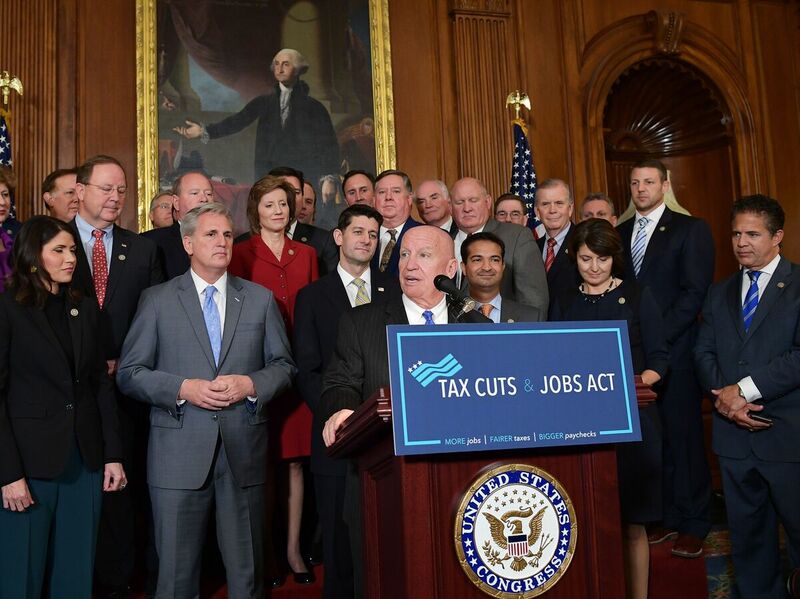 Congress Takes Aim At Tax Rules That Hit Hardest At Upper Middle Class The alternative minimum tax was designed to prevent very wealthy families from dodging taxes entirely. But its reach has grown over the years, and now it hits hardest at upper-middle-class workers. House Ways and Means Committee Chairman Kevin Brady, R-Texas, speaks after the House passed its version of the Republican tax overhaul on Nov. 16. The measure includes a repeal of the alternative minimum tax. Marilyn Mollenedo spent years working at a series of administrative jobs. So when her husband landed a well-paying position in San Francisco, she figured it would finally enable them to put aside more money for retirement. Instead, her husband's salary, coupled with a generous pension from an earlier government position, thrust them into a costly new tax category, where they had to pay the alternative minimum tax. This week, the U.S. Senate is expected to vote on a version of a tax-overhaul bill that would eliminate the AMT. The approved House bill would also scrap the tax. The AMT hits some 5 million households a year, targeting high earners who take a lot of deductions. It wasn't supposed to be like that. When it first took effect in 1970, the AMT was intended to keep the superwealthy from dodging all taxes by taking too many deductions. Congress passed the AMT after the Treasury revealed that 155 high-income households had not paid a dime of federal income taxes. "It's designed to make sure that wealthier people pay a reasonable level of tax," says Frank Clemente, executive director of Americans For Tax Fairness. But the AMT was not indexed to inflation when it was instituted, and over the years, it started to hit more and more people. Congress regularly made updates, or "patches," to the rules, but still, the AMT has expanded its reach to hit more and more families who are comfortable, but far less than superwealthy. They are families such as Mollenedo's. "We came from fairly modest means growing up as children, and we always worked really hard and thought working is the path to financial security," she said. "And then all of a sudden you're making really good money, and you think, 'Wow. I should be able to really live it up now and buy nice things and put money in the bank and stuff,' " she said. "And then instead, you get a shock when you do your taxes and go, 'Oh! I have to pay this all in taxes.' "
Mollenedo was targeted in part because she lives in California's Sonoma County, an expensive area where local taxes are high. "As the AMT has been changed over time, it's tended to fall more and more on big families, and families in high-tax states," says William Gale, co-director of the Urban-Brookings Tax Policy Center. Dorothy Higgins, who works in advertising, has regularly fallen into the grip of the AMT, in part because of the high local taxes that she and her retired husband pay in their home state of Connecticut. She says they pay about $40,000 in property and local taxes, but the AMT negates their deduction for local taxes, "so it returns you to a higher taxable income, and then that causes us to pay another $12,000 in taxes." Higgins is quick to say she realizes that she and her husband live better than most people and they don't object to paying taxes, especially if it goes to support social services. But she points out that these days, the AMT falls most heavily on the working upper-middle class, not the truly rich who tend to derive their wealth from stocks that are taxed at the much lower capital gains rate. Scrapping the AMT would lower the potential tax hit for affluent families. But the AMT has survived for decades because it generates a lot of money for government coffers. Eliminating the AMT would cost the U.S. government some $700 billion in revenue over the next decade, about half the estimated price tag for the tax bill Congress is now considering. It would also potentially remove some of the constraints on the use of tax shelters by the wealthy, allowing taxpayers to take advantage of more loopholes and deductions, Gale notes. "AMT repeal would increase significantly the number of high-income and wealthy people who would pay no income tax," he says. Among them could be President Trump himself. In 2005, Trump earned about $150 million and because of the AMT paid about $38 million in taxes, according to portions of his tax return that were leaked to the media earlier this year. Without the AMT, Trump's tax bill that year would have been about $5 million. NPR senior business editor Marilyn Geewax contributed to this story.